This review (by Michael Hirschhorn) of a new book on Pixar contains the best sentence I read today: "[Intellectual property lawsuits] follow successful entertainment businesses the way seagulls trail fishing boats." 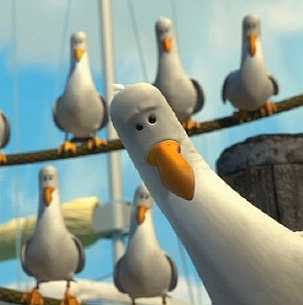 Anyone else remember the "bert, bert, bert"* “mine, mine, mine” seagulls in Finding Nemo? Imagine them with briefcases….. This entry was posted in Reading on June 24, 2008 by Espen. Nick Carr is snarky about Jim Wales’ new slogan for Wikipedia (“the online encyclopedia in which any reasonable person can join us in writing and editing entries on any encyclopedic topic,”) as opposed to the previous free-for-all. But he misses the point: Any business or endeavor with strong network externalities goes through phases of growth, and Wikipedia is now transitioning from “need stuff” to “need better stuff”. My Master and executive students have been editing Wikipedia as part of their courses for 5 years. The comment when we started was “boy, this is fun”. 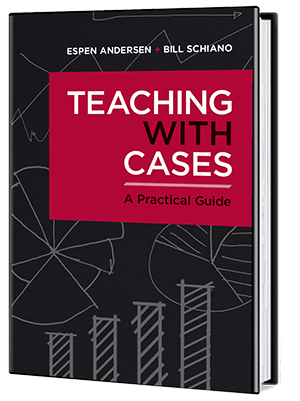 Now it is “it is really hard to create new articles, we either get shot down or the topic is already covered.” Life is easier in the Norwegian version (170K entries) than in the English one, where norms are nailed down and text quality, at least on any substantial entry, is high. Progress, the revolutionaries become the incumbents, life goes on, etc., etc. This entry was posted in Digital reflections on June 23, 2008 by Espen. This interesting article in the Economist shows how American politics is becoming increasingly polarized partially because when people move, they locate in areas with similar cultural preferences – be it granola or shotguns. When I lived in the States, I was always fascinated by the difference between Vermont (Birkenstock and yogurt country) and New Hampshire (main business: roadside hubcap emporiums). As it turns out, this split between liberal and conservative is happening all over the country, and you end up with the curious situation where the United States from the melting pot evolves into a salad, with rather few ingredients. All this is interesting, but hardly relevant for technology, no? As a matter of fact, not: I am currently working on a research project with nGenera, called BST: Putting Business Simulation Technologies to Work. Simulation allows us to see the aggregate effect of many small decisions. In a surprisingly short time, the initially well distributed matrix transforms into clear clusters (even bands) of white or black. Importantly, this process, when viewed from a distance, seem to be conscious, yet the relatively mild preference exhibited by each individual dot seems rather harmless. It may be tempting to ascribe the segregation to some conscious plot, failed policy or other single cause. It is a very powerful demonstration of the aggregate and cumulative effect of small decisions and weak preferences – and simulation is the only way to make it apparent. Resnick’s book shows similar uses of simulations to understand ant foraging strategies and traffic jam formation – and some of the insights have been put into use in real life. For instance, traffic lights at on-ramps that introduces cars into traffic flow in an even stream rather than random groups is, as far as I know, a direct result of simulations of traffic jam formation. In science, business and politics, we are moving from isolating single factors and varying them to understanding interaction patterns between many small components. Simulation allows us to understand this – the challenge lies in understanding where and how this very powerful tool can give insights. And there you have Vermont and New Hampshire, Virginia and Maryland: The results of weak preferences over time. Perhaps we could simulate some real political discussion at some point? This entry was posted in Academically speaking, Business as unusual, The thoughtful manager on June 22, 2008 by Espen. Here (PDF) is my presentation from Open Nordic 2008. Anyway, I had saved my presentation, and when the other speaker had finished, I pulled out the power cable from my Lenovo X61 Tablet laptop to walk up and check that it would work with the projector. Well, for once the backup system worked, as did everything else. Knut Yrvin put up his laptop (running Linux, incidentally), I logged on to my account at Foldershare.com, and lo and behold, the presentation which I had saved just minutes earlier was there in all its glory. Downloaded it to Knut’s’ laptop, opened it (in OpenOffice 2.4), and it ran like a charm. Backup and interoperabilty, folks. It’s the new black. I can’t recommend Foldershare highly enough. A life-saver. It can sometimes be tricky to install on some corporate networks, but boy, what a tool. Get it. It is free from Microsoft and, to quote Jerry Pournelle, It Just Works. Get It Now. Now I just have to hope that my hard disk can be salvaged – while I have backup of my documents and email, there are some files and programs that for various reasons (mostly sloth on my part) were not backed up. As for getting a new laptop, that may take a week or two, but since summer is coming and I am mostly working from home anyway, that shouldn’t be too much of a problem. This entry was posted in Digital reflections on June 20, 2008 by Espen. I am at the Open Nordic Conference in Skien (about two hours south-west of Oslo), listening to Lars Ingvald Hoff from Telenor R&D talking to a bunch of developers about the new, platform-like SIM cards coming out. The new SIM card has plenty of memory "gigbytes", USB interface (means you can get data from the SIM card real fast), virtual machines (or at least virtual memory areas, closed off, called SSDs). Tele operator has control of the card, application developers can install SSDs (whatever they are) that run in a sandbox. One business model may be that operators will charge rent for space on the SIM. Seems like a pretty full architecture to me. Translation HMTL to APDU (command language for phone) in a web server on the card, so in principle you could move your cell phone onto the net. Alos has a "Java Card", where you can to some extent can have interoperable applications running between manufacturers. Secure and certified environment, not full Java stack , but a pretty good selection. Standards based, not operator-specific. FC: New short-range communications protocol, can be used to access payment terminals and similar, secure devices. Apps can be downloaded and installed via a variety of protocols (among them BIP (Bearer Independent Protocol) directly to the SIM card. In other words, mobile phones are going to open up to a much larger extent. I predict that the SIM card over time will become you – an identification and payment device. Future future SIM card – you will get IP stacks, threads, full Java virtual machine, will look more and more like a server. This entry was posted in Digital reflections, Network research on June 20, 2008 by Espen. Tomorrow I am giving a talk on disruptive technologies at the Open Nordic Conference, and how that theory applies to open standards and open source in the mobile technology industry. The audience is apparently very technical and I, quite frankly, do not think that open source plays that much of a role – apart from providing available functionality for innovators (mostly at the user interface/user service level) to build on. The challenge in mobile technology (and in any consumer technology whose aim is to facilitate interaction) lies in establishing a platform for users and business to build on. Right now I am listening to Nick Vitalari analyze platform establishment and growth as part of the nGenera project PBG: Building a platform for business growth. Product (or service): The solution to the problem gets productized, either in a closed or open fashion, using standard or collaborative programming and development processes. Platform: The solution expands both in scale (distribution) and scope (technologies it can run on, added services, links to other solutions) until it is less a solution in itself for others to build on, where customers and users get it less for itself than for the added functionality it provides. In the end, it will be forced into some form of openness. Half-baked so far, but it’s a start. This entry was posted in Academically speaking, iAD, Network research, The thoughtful manager on June 19, 2008 by Espen. Will the real security please stand up? Peter Cochrane has it right – our preceptions of security and risk are way off. The single most dangerous thing I am doing today is probably driving my daughter to school. The most dangerous part of an airplane trip is driving to the airport. And the biggest security threat to your infrastructure is the employee who inadvertently posts your marketing plan on a world-readable wiki or stores his password on a Post-It note under the keyboard. Michael Pollan says something of the same in In defense of food – that low-fat diets cause you to eat processed food and trans-fats, which are unhealthy. Instead, you should eat fresh, varied and pleasing food. In other words, use common sense, taste buds, and simple mathematics. Trouble is, that approach is hard to productize and market….. This entry was posted in Digital reflections, The thoughtful manager on June 13, 2008 by Espen.